Sierra Leone’s Minister of Finance, Jacob Jusu Saffa will lead a-five man delegation to this year’s Annual Meetings of the African Development Bank (ADB) that will take place in Busan, Republic of Korea from 21-25 May 2018 on the theme, “Accelerating Africa’s Industrialization”. The AfDB meetings will also hold at its margins, the 6th Korea-Africa Economic Cooperation (KOAFEC) Conference. The Bank Group meetings would be preceded by high-level seminars and workshops, including other side events relating to the theme of the Meetings. Mr. Saffa noted that Sierra Leone’s participation at the meetings is a demonstration of Government’s support to the Bank and an appreciation of the Bank’s contribution to the socio-economic development of the country, pointing out that It further goes to strengthen the continued cooperation between the Bank and the Government of Sierra Leone as well as to unlock potential support to the country’s development. It should be noted that the African Development Bank has been “an important partner” in the development of Sierra Leone. 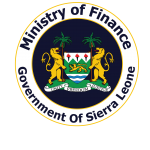 The Bank’s Portfolio for Sierra Leone as of March 2018 includes 19 operations for a total commitment of UA 161.91 million (USD 243 million) and this comprises 4 institutional supports, 12 investments (94.10%) and 2 emergency operations. In this regard, cumulative disbursement reached UA 59.45 million (USD 89.2 million), a disbursement ration of 35.02%. It should however be noted that in recent years, Sierra Leone’s overall portfolio performance “has not been quite stable”, according to the Director of Economic Policy and Research Unit (EPRU), Alimamy Bangura. 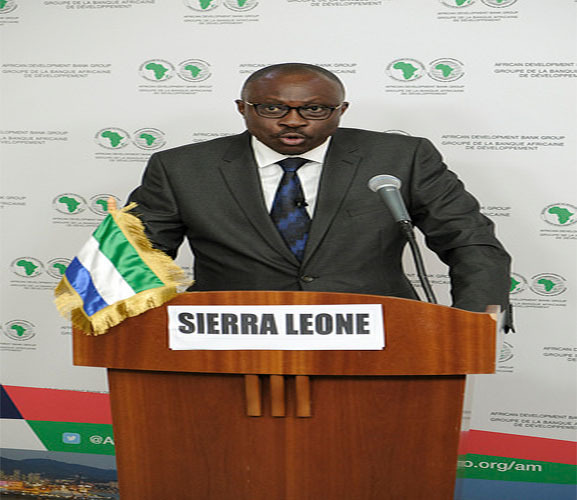 According to Minister Saffa, Sierra Leone’s participation to the meeting “cannot be overemphasized,” while he stated that the benefits of attending the meeting are multifaceted. Firstly, Minister Saffa assured that it will give the Government of Sierra Leone the opportunity to discuss the factors responsible for the weak portfolio performance, with the view to resolving them with the staff and management of the Bank. Secondly, the Finance Minister maintained that the visit will create an opportunity for his team to review the country’s existing portfolio so as to realign it with the priorities of Government as was done with the World Bank and to as well firm up commitment made by the Bank on pipeline projects. Minister Saffa expressed hope of meeting with the President of the African Development Bank or its senior management “to request an enhancement of the planned budget support to Sierra Leone” that was not disbursed under the former administration. He indicated that his delegation will hold discussions with and seek support from the African Legal Support Facility for the review of mining and other agreements. “More importantly, the meetings will also create an opportunity to hold bilateral discussions with other development partners who will be attending the meetings with the view to soliciting financial and technical assistance for the implementation of our development programmes and to firm up commitment already made by such donors,” Mr. J. J. Saffa asserted. The delegation will comprise, the Minister of Finance in the capacity of Governor of the ADB, the Financial Secretary, an Alternate Governor of the Bank, the Director of the EPRU in the Ministry of Finance, the Deputy Financial Secretary in charge of multilateral projects also in the Ministry of Finance and the Governor of the Bank of Sierra Leone, an Alternate Director to the ADB.